The Duchess was in a new coat for Christmas at Sandringham today. Here is a quick video from ITV of the Royals on their way to services. 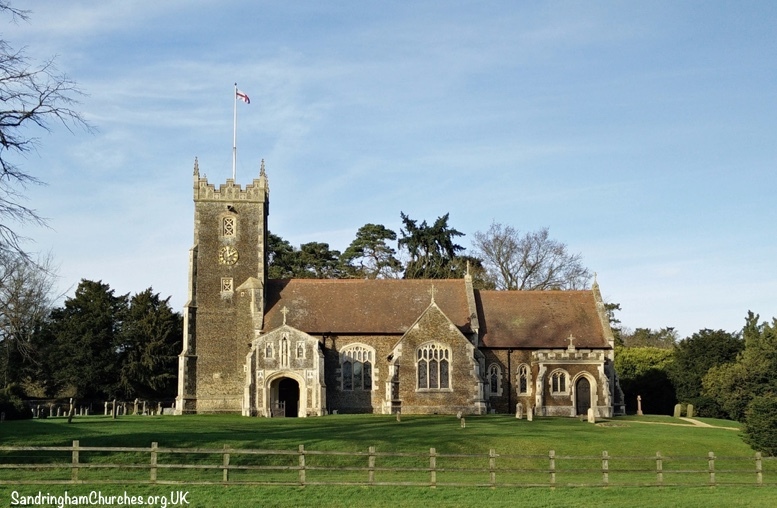 Kate and William joined HM, Prince Philip, and many other royal family members at the church of St. Mary Magdalene. Also among those attending, Prince Harry’s fiancée, Meghan Markle. 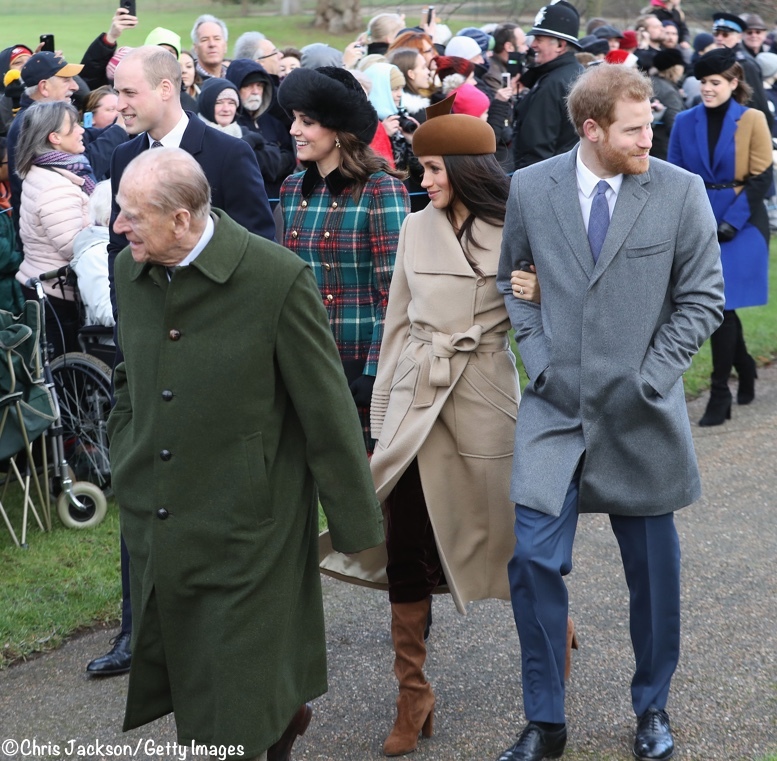 Below you see the couple along with Kate and William; Meghan was wearing a Sentaler wrap coat and Stuart Weitzman boots. We’ve had several comments about the Queen’s ensemble. Here you see HM and the Duke of Edinburgh just after the service. I included a small inset of HM’s brooch. Bows and curtsies for the Queen as HM departs after the service. Following the service family members chatted with those gathered near the church; many brought flowers or other gifts for the Royals. Here is a quick video Francesca shared on Twitter. Now for our look at what Kate wore for today’s church service. 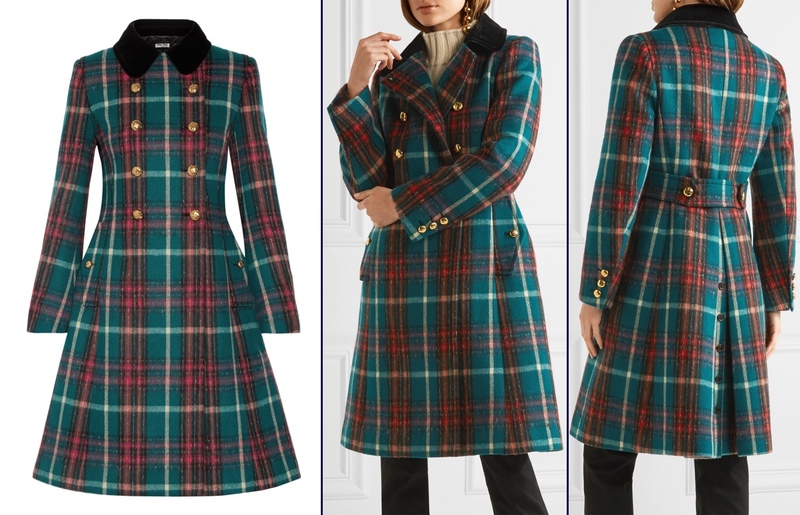 Kate wore the Double-Breasted Tartan Pea Coat by Miu Miu. It is a wool/alpaca blend with classic double-breasted styling, velvet collar, back belt and inverted pleat, vertical front pockets with oversized tabs and domed gold buttons. The coat is sold out on Net-a-Porter’s US site, but still available in limited sizing on the UK site (£2655, about $3500 at today’s exchange rates). This offers a view of the button detailing inside the back pleat, as well as a closer look at the fabric. Our thanks to Melissa Reid and Kate’s Closet for today’s coat ID. Kate carried her Bayswater Wallet Clutch by Mulberry. And she wore her Tod’s pumps. UPDATE: savvy ID expert Kate Johnson shared on the Facebook page that Kate appears to be wearing another Lacorine alpaca hat. Thanks also to Olga who suggested in a comment that Kate could be wearing this hat. This is the brand’s Sumac style in black. Below, another view. 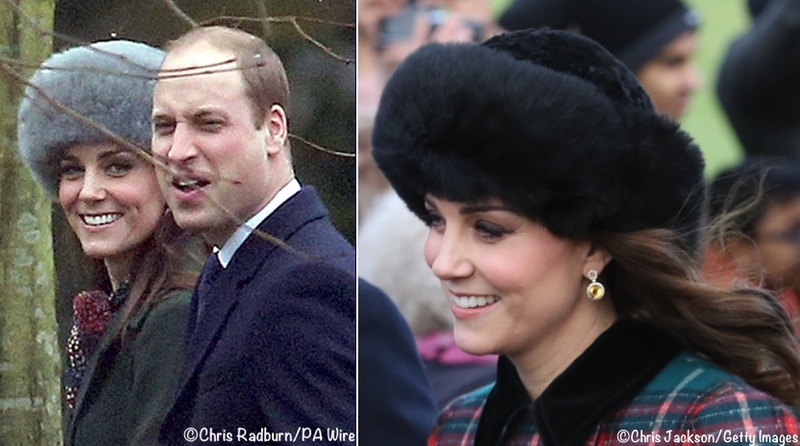 Kate has previously worn Lacorine; below you see her wearing the silver-grey Sumac style at Sandringham in January. UPDATE DEC 27: In a post on its Instagram page, Peruvian Connection says the Duchess is wearing one of its hat, the Vallnord style, also made of alpaca fur. In the montage below you see the Vallnord in the center. I have sent an email to Peruvian Connection to ask for their input. UPDATE #2 DEC 28: Lacorine has emailed to say that after speaking with Lock & Co., where Kate purchased the grey Sumac worn above, they cannot confirm the hat worn Monday is theirs. Peruvian Connection has not responded to my email. At this point, I am unclear as to whose hat Kate wore on Monday. The Duchess also wore gloves today, I believe they are her Cornelia James ‘Imogen’ pair. UPDATE: Cornelia James verifies that Kate is wearing their gloves, the Alice style in merino wool with a velvet bow at the wrist. UPDATE: A friend has gotten in touch and shared a photo that shows Kate is wearing the Alice glove by Cornelia James. 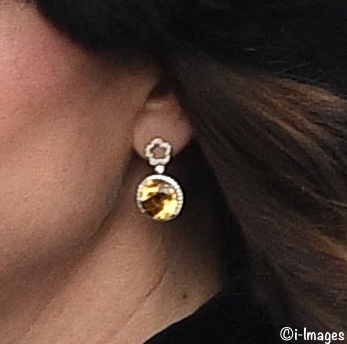 Kate also had on what looks like a new pair of earrings by Kiki McDonough. The upper portion appears to be the Diamond Flower style, while the drops look like citrines bordered in diamonds. UPDATE: With thanks to Iva, these are not new earrings, they were worn for a 2016 garden party in Northern Ireland. Here you see the Duchess today and at the garden party. We’ve also had comments about the look worn by Sophie, the Countess of Wessex. Anna of My Small Obsessions and the Countess of Wessex blog noted on Twitter that she was in an Erdem coat, a Jane Taylor hat and she carried a Noble Macmillan Tassel Pouch. Below right I included an Erdem dress at Matches Fashion in what looks like the same material. Also looking chic, Sophie’s daughter, Lady Louise, in a coordinating shade of color below left. Here is a look at Kate’s Christmas Day ensembles over the years. We’ll leave you with the BBC’s story about the royal family attending today’s services. We’ll update with more info and photos as soon as we have time. (We’re slated to head out of town but are buried in snow, so we may be back here sooner than expected.) Merry Christmas! 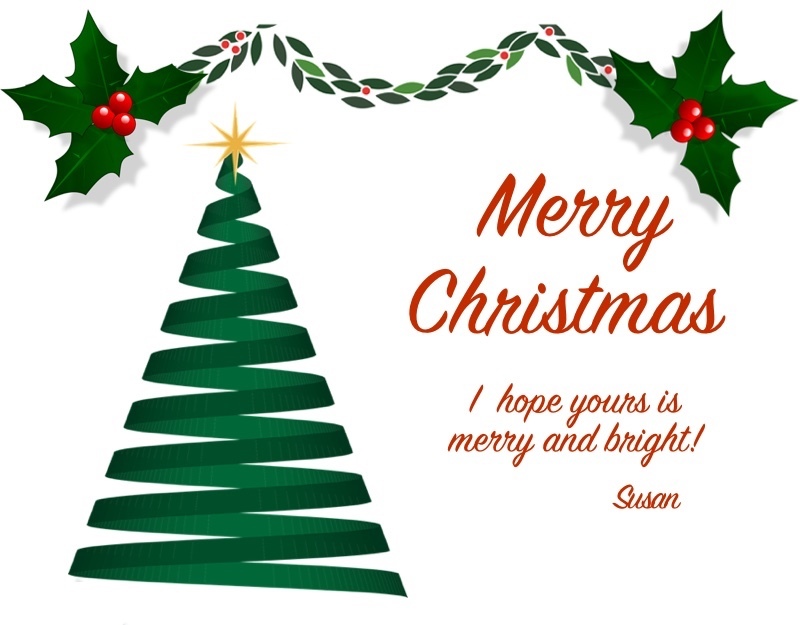 Susan, I hope you had a wonderful Christmas and wishing you a very Happy New Year! I thought Kate’s coat was beautiful and both festive and appropriate for Christmas. While the hat may not have been something I would have thought to pair with the dress, she certainly was able to pull it off. Overall, a very lovely look. I like this look on her, especially at Christmas – very put together. And she is positively glowing with happiness! Giddy isn’t the right word, but clearly relaxed and happy. Not too keen on what others wore, with the exception of Autumn Phillips. I could see Kate in something similar. Thanks for the coverage. Happy New Year to all. Can anyone recommend a brand of tights like Kate’s that are matte? I have had an impossible time finding any in the U.S. Many thanks in advance! The Duchess’s Christmas Day outfit is the one I look forward to the most and for me, she certainly didn’t disappoint this year. I adore the coat and would absolutely pair it up with all black accessories like Kate did. I totally understand that some readers may think it’s all slightly frumpy but this is the sort of clothing that country folk wear. Meghan looks great – very glamorous. Susan, per what you have written before, you are not going to do a style blog about Meghan Markle, and you will continue with this blog about the Duchess of Cambridge (Great!) If this is still the case, may I ask you to please not publish comments comparing Kate with MM in any way? It is so annoying! People simply do not get it. Kate and MM are two completely different women with completely different fashion styles, and anyway, they are not competing with each other. This so-called “competition” has been maneuvered by the media, and some people just cannot step away from this nonsense. There are many fashion blogs solely dedicated to MM, so all those who want to comment about her should do so in those blogs, not in this one. 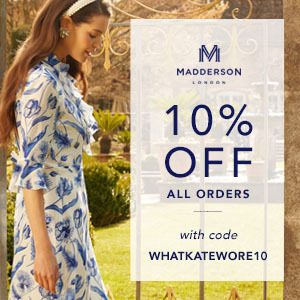 I know that when Kate and MM are together, those photos should appear in this blog, but that is all. Comments regarding who looked better dressed, styled, younger, etc. should not be published in this blog at all. Thank you Susan. I am a bit torn with this. Of course, I’d rather not see comments pitting the two against one another. However, when they are both at the same event, it makes sense to comment on anyone in the picture. I see many comments about Sophie, the Queen, and others in the photos. Perhaps we can all try to avoid being too sensitive. When a comment is made about Sophie, it’s no big deal, but when someone makes any comment (positive or negative) about Meghan, it is an inflammatory comparison. I just don’t agree. Let’s all take a deep breath and realize it’s ok to comment on anyone in the photo. I agree with you, Madeleine. While I find the repetitive, negative comparisons tiresome–there have been some involving Queen Letizia that were just endless and pointless–and I would never want to pit one person against another, it’s only human to notice and comment on what others are wearing as well. Remember the Princesses Beatrice and Eugenie at the Cambridges’ wedding? How could you *not* comment on what they were wearing? In general I’d say that while it’s totally appropriate to comment on others’ outfits, it’s not appropriate to treat it as though it’s some sort of zero-sum fashion competition. But I’m inclined to think that it’s the responsibility of commenters to police themselves, rather than expect Susan to do it. Jessica, so according to you, it is the responsibility of commenters to police themselves, rather than expect Susan to do it? Susan reads every comment before she allows it to be published in this blog. If she didn’t have this rule, obnoxious comments containing personal attacks and negative speech would be published. You and Madeleine are misinterpreting Vivianne’s comment. Whenever the Duchess of Cambridge and Meghan Markle appear together, those photos will be published in this blog. To comment on the fashion style of each lady is perfectly all right. But, to pit the style of one against the other is not proper at all. Unfortunately, that is exactly what many in the world’s media are doing and will continue to do. Vivianne is asking Susan to please not do this in this blog. I agree 100% with Vivianne, and I add my voice to hers in asking Susan: Please do not publish comments in which the commenters set Kate and MM in conflict with each other. This is totally worthless and despicable. I think Jessica is suggesting that readers edit themselves in writing comments so they don’t pose a problem at the outset. Obviously, from my perspective that is a highly desired practice. It is also something I think 95% of the readers already do, minimizing my participation in the process and allowing the dialogue among readers to flourish. I don’t believe Madeleine or Jessica or any other readers are interested in seeing Kate and Meghan pitted against each other. My perception is they are simply not in favor of heavy-handed editing that would have me deleting the sort of comments that are currently accepted when referencing Sophie, Zara Phillips, or others, like Princess Stéphanie in Luxembourg, or Princess Mary. I appreciate Vivianne’s concern, for there is an abundance of “Kate vs. Meghan Fashion Smackdown” stories in other media. That’s not going to be allowed here; it hasn’t been in the past and won’t be in the future. But comments with opinions like, “I liked Kate’s style more than Meghan’s today,” or “Meghan knocked it out of the park,” are perfectly acceptable. Thank you, Susan; you have explained that better than I did. You do a wonderful job moderating the site. To be honest, I was rather disappointed in both women’s outfits. I thought they’d do something amazing for their first photo op together. Kate’s coat at first glance looked like a horse blanket. I looked at the model and liked the Miu Miu tartan coat more with the dreamy, creamy-looking turtle neck. But wearing the turtle neck would require separates, which aren’t comfortable while pregnant. A scarf in that Miu Miu tartan paired with a red coat like her red CH coat would be Christmas-y and photograph better. A John Boyd hat, like the fabulous grey one he made for her grey & black lace Erdem coat, in red or green (depending on which suede accessories she choose) would be far better than those fake fur hats and scarfs that photograph like synthetic rugs. I liked Meghan’s suede boots, gloves, and Chloe bag. I’m sure the camel coat is beautiful in person but it washed out in the photo. I would suggested white, navy or black for more contrast of those gorgeous caramels. Perhaps olive or forest green to get in the Christmas spirit. The hat’s caramel color was pretty but it looked like a wine cork and gave her a big head. Chuck it with the fake furs! I made a tasteful yet negative comment several months ago that was deleted as well and I have not commented since. While we all appreciate the classiness of this site, let’s face it, after 7 years of DOC clothes watching many of the comments are always the same — regardless of the outfit. It is the varying opinions of the posters that keeps the site interesting. Loved the horse blanket comment! Thanks for your candor. IMO, a red coat with that tartan fabric serving only as a scarf accent would have been a very ordinary and safe option. Not many can wear that much expanse of plaid and still look good. Kate has the figure and height to do it, even pregnant! Also, the hat is reportedly alpaca, which is not a fake fur. What some people fail dismally to understand is that the Duchess of Cambridge is her own person. Her fashion tastes do not have to be the same as yours. Photos of the Duchess are published all over the world, and everyone has their own opinions. There is no way that she can satisfy all the people all of the time. Many people demand that the Duchess “amaze’ them each and every time she steps out. This is impossible. All those who want to be shocked and owed by how someone dresses, should follow Amal Clooney. Amal wears different top designer labels every day. She wears haute couture fashion. The Duchess would be crucified by both the press and most British people if she were to do that. The Duchess has very different priorities. Please let the Duchess of Cambridge be! She is not everyone’s personal fashion doll! Some people think that they can unload all their negativity and spite on her through their comments “about fashion & style only, nothing personal.” If you believe that, then I have a bridge to sell you. The DoC is doing a wonderful job as a wife, mother and future queen. I like and admire her very, very much. I also stand ready to defend her from personal attacks couched in fashion style commentary. Indeed! Kate is really glowing in these photos, happy and confident. Lovely choice for the Church & family walk. What a great coat, although one would have to be as slim as the Duchess to wear it. Kate’s hat, earrings and shoes are just perfect too. Thanks for posting the pic of Kate in the brown Christmas outfit. I think that one is my favorite. How to wear brown right! I love this coat just because I am a sucker for tartans/check/plaid. I like the Russian hat too but not really digging this whole ensemble together. I think a wool felt hat would have worked better for a more balanced look. This hat is calling for a heavier plush coat? Sophie’s outfit seems a bit out of place…in my opinion. The queen and Camelia all look stunning in vibrant colors! Gosh, I think this is a great look. So festive and vivacious. I love both the coat and the hat, and I think they look well together. Her hair looks terrific, and something about the colors of the coat and the fur fringe of the hat really make her eyes sparkle in a wonderful way. 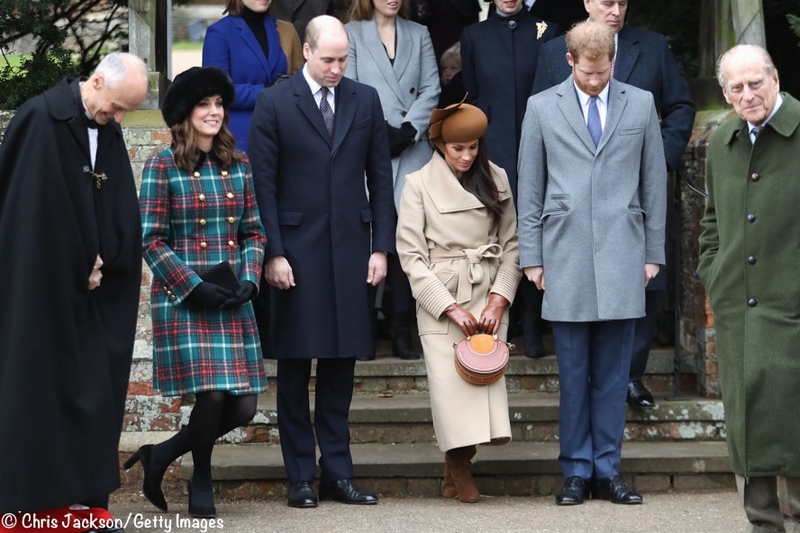 I don’t share the Duchess’s fondness for statement buttons–I agree with some others that I’d have liked the coat even more with self-covered buttons or black ones–and I also agree that some sleek boots might have paired better with the hat than her trust Tod’s pumps (which I do love). Meghan certainly does have great taste in coats–but I think she could use a little gentle guidance in the great British tradition of hats. 🙂 It will come with time! Gold-tone buttons are meant to accentuate and enhance the overall tailoring of a garment. Gold buttons are classic not “statement” and self-covered buttons or black buttons on this coat would, IMO, make the the coat plain and unexciting; less a beautifully classic Xmas coat! And, even though I and most others would probably never wear this coat that “buttoned-up,” well . . . that is Kate’s style since becoming a Duchess. I also don’t understand what makes people think she did not have this coat altered for her pregnancy. Something tells me she did. I think the filt is better than some bespoke items she has worn while not expecting and I also think that pregnant women look doudy in longer lengths. Best to stick to shorter when you have a bump! Perhaps I should have said “showy” buttons? I do realize they’re a classic motif, but I generally find them a bit much. I agree the coat would be a little plainer and less exciting without them; that’s not necessarily a bad thing. The tartan is so cheery, IMHO it doesn’t need the embellishment of bright buttons. I understand that it’s a matter of opinion and I have to disagree with you on the buttons. I don’t see anything wrong with them. I totally agree with you about Meghan’s hat. It did not look good and ruined her look. I like her coat though…I can see myself wearing it (but unfortunately I cannot afford it lol). 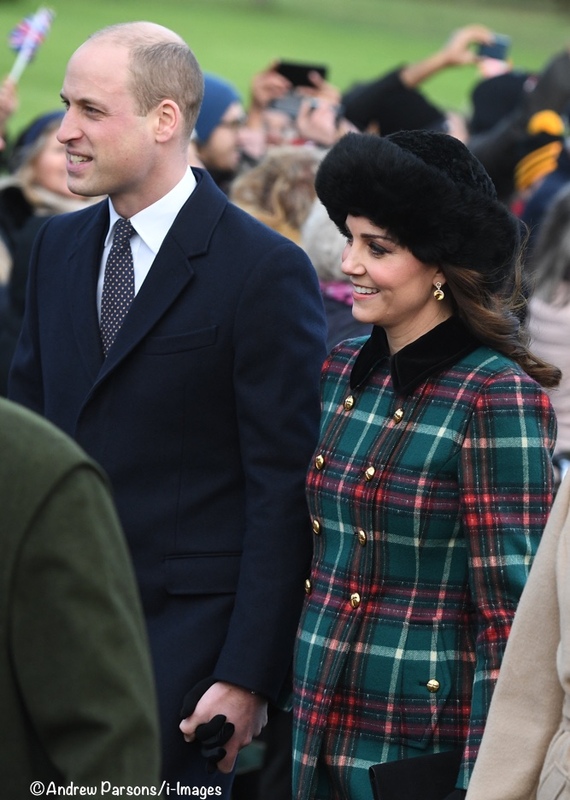 I love plaid, especially a good Christmas plaid, so the material for Kate’s coat gets a big thumbs up from me. I also really like the back with the open pleat and buttons. The gold buttons on the front though – why Kate, why?? I feel like its becoming comical at this point! she loves buttons! So anyway, buttons aside, I also didn’t like the hat. I feel like Kate can “pull off” very specific kinds of hats and others just don’t work for her, and this is the latter. I don’t think the coat is too short for her (although she looks kind of cold in the heels and shorter coat), but when you look back at her prior Christmas outfits, I think she looks a lot better in longer coats. She is taller and has long legs and can pull off a longer coat without looking overwhelmed by it. But that’s just my personal preference for her, she may disagree, lol. So final opinion – I think she looks really nice, love the plaid, could have done with a different hat. I’m sure with 101 comments all my opinions have already been shared by others! But I just had to comment after seeing a photo of the young royals on the Kensington Palace Instagram. I really like Kate’s coat, and I think the colours look great with her hair. I’m not a fan of the hat at all, I find it quite silly, but I can understand the position of wanting to keep one’s ears warm while maintaining a bit of a formal look, so a toque or knitted cap or earmuffs don’t really work in this situation. And on the subject of temperatures, I’m impressed that Sophie wasn’t freezing in the third-quarter length sleeves. Harry looks all bundled up in front of her! As for Meghan, I also don’t want to compare her to Kate, but I do really like her taste in handbags and hope she doesn’t default to clutches as well once she starts undertaking more royal duties. I love that she’s been sporting so many Canadian brands too! Thanks for working on Christmas, Susan, I’m sure we all appreciate it! Hope everyone had a wonderful holiday! Bright, cheerful, Christmassy, seasonal, relaxed, happy, colourful, beautiful. I could add more adjectives to my list to describe the Duchess on this occasion, but I think readers will get my gist! Kate has that beautiful glow! Her skin looked great and she looks happy. I love her outfit especially the hat. I do think that a pair of boots would have made the whole look perfect. Someone mentioned that the Todd shoes might be more comfortable for her so that might explain her choice. I do not understand the grumblings of some as to Kate’ coat not being a “maternity” coat. Kate chose this coat; before purchasing it, she tried it on, so it follows that if she bought the coat, then she felt perfectly comfortable in it, otherwise, she wouldn’t have acquired the coat. People, please remember that we are living at the end of the year 2017 in the 21st Century. In these modern times, pregnant women are not limited to wearing only “maternity” specific clothes. Pregnant women can now wear whatever they feel comfortable in (maternity or non-maternity.) Kate not only looks fabulous in her beautiful tartan coat, but she looks perfectly comfy in it. Case closed. Here’s wishing everyone a prosperous, healthy and much more T-O-L-E-R-A-N-T of others’ choices New Year! First of all, I am thrilled to see Kate and Meghan together. So exciting!! As an American, I can’t tell you how fantastic it is to see Meghan with Kate, who I adore. Kate looks so traditional and festive. The coat is beautiful and couldn’t be more appropriate for the occasion. And her hair looks so wavy and pretty under that cozy hat. I mean, what more could anyone want? I like this coat for Christmas, but not sure I would like it for any other time of the year, so it seems like a bit of a “one and done” for me. I also wish the buttons were black or self covered instead of the bright gold/brass tone. I don’t mind the way it hangs, despite not being maternity but suspect it won’t fit her very much longer given her rapidly changing figure. I like the hat and it appears to be warm. Totally do not understand the earring choice and wish she would have worn black boots or even those short bootie/shooties that were worn last week to the ballet. All in all, this look is fine but doesn’t bowl me over. I have to say, I love this look on the Duchess. The tartan in really festive, but not over the top. I really like her black hat and believes it matched well to the velvet collar (and velvet is very on trend this season). While I do wish the gold buttons were velvet to match the collar as another person mentioned, I like how she paired it with her citrine earrings to match with the gold buttons. Overall, this is a fantastic look in my opinion. I did love seeing the Duchess and Meghan glancing at each other and often talking. I’m sure these women will form a lovely relationship. Meghan’s outfit was subdued and I think appropriate, although I would have to say a miss for me. She does look so happy which is most important. As a fellow American I would love to see her champion some American designers, but I do understand it is more of a wise choice to select Canadian designers. Thank you for always producing such fantastic posts. This blog is such a favorite of mine and I do appreciate all of the hard work you pour into making so great! I love the coat and think it looks lovely on Kate. I would have preferred her to match it with her suede boots. I really do not like this style of hat, although it looks fine on Kate. Is it really cold enough to necessitate this kind of hat? She looked very happy today! I happen to like the coat a lot, but it would look better on Kate if she wore it when not visibly pregnant. In other words, the time has come to move into maternity clothes, Kate. Thank you Susan, for a year of stellar reporting and lovely images; and thanks to all the commenters for your thoughtful, thought-out and on the whole respectful comments. This blog is a pleasure to read. Lisa the buttons in the back pleat are a throw back to a design, used when riding a horse. The rider would undo the buttons, therefore enabling the person to mount the horse, with the coat hanging down each side of the horse’s body. Of course, Kate is not going riding…I don’t know if she ever rides, but the design harkens back to that idea. You often see this in one of those waxed canvas coats that are worn on farms. I had no idea why the buttons were that way on the back…fascinating! I didn’t know this! Fascinating information. I never knew this back belt originally had a utilitarian purpose. I learn the most interesting things on this site. Yes, I was going to make comment on these buttons. I learned it from old films. Soldiers and gentlemen in old days wore their riding coat this way, but way longer. Thanks a lot for the post! I was wondering. Do royals never were scarves? I never see scarves. I can not do without a scarf in the winter. Is there a protocol about scarves? For me it seems so cold without a scarf during winter. But I like the outfits very much! I love this look. The coat is so beautiful and cheerful, and she looks fantastic. I like the hat too and think it was a smart choice, as it looks warm and fashionable. This may be one of my top favorite looks for her. I think Kate looks superb. I love the tartan coat. It looks celebratory to me, between the colors, the great black collar, and the gold buttons. The detailing on the back is lovely. (I have one Mui Mui coat, and one of the reasons I purchased it was for the back belt and detailing.) Too often the back of a coat is left like a blank canvas. Just there waiting for something to happen.This coat, especially for Kate who walks around after church greeting people and chatting, provides visual pleasure from all angles. Love the hat, too, and the way it frames her face, shows off her earrings, and leaves her hair down her back. Also prefer the shoes to boots.I think she styled the outfit perfectly. Especially when you compare it to some of the others she wore on Christmas — muted, even dull. She knocked it out of the park. While Kate looks absolutely radiant I am afraid I don’t like her outfit. I have loved her past Christmas looks but not this one. I am not a fan of this look. I agree, the elements separately are safe choices, but together it’s kind of Kremlin meets the nutcracker. It just seems like a lot going on, between the big furry hat (which I like but not with this jacket) and a really festive coat, that sadly is not maternity and doesn’t hang correctly, it looks uncomfortable along her shoulders and bust. She does look beautiful and very happy, but as slim as she is, I think it’s time for her to surrender to maternity cloths (as much as we all hate maternity cloths, you know, which is pretty much any of us who have had children), so it’s a hard pill to swallow, but it’s amazing what good tailoring will do for one when pregnant. Agree! Kremlin meets the Nutcracker is the vibe I’m getting too. This coat is a modern design by an edgy designer but somehow Kate has made it look like a vintage throwback and not in a way that’s pleasing to me. I think I’d prefer it with a black turtleneck underneath and less buttoned up, with cute black booties. I would prefer it even more with edgy black trousers but that’s never gonna happen clearly. Sophie looks like she’d be freezing to me! Meghan looks like the warmest of the bunch. I disagree, but your quip about “Kremlin meets the Nutcracker” made me laugh! Many of us commented that Kate and family didn’t look very Christmassy in the photo on their official Christmas card. Well Kate certainly made up for that today, with the festive red and green look. While this coat is fun to wear over the Christmas season, I couldn’t imagine wearing it at another time of the year. A little tartan goes a long way and this tartan is very bold. I did like the Black Watch tartan coat, that Kate wore in 2013. But that tartan is navy and hunter green, which are not such contrasting colours to each other. While the coat is beautifully tailored, it is not a maternity coat and that creates a slight issue. I do like the black hat, shoes and tights and would have preferred that the gold buttons be covered in black velvet to match the collar. I think the citrine earrings are a total miss. Meghan looks well put together but more subdued. The Queen is in a knock out colour. Sophie must be cold without a heavier coat. And how wonderful to see Prince Philip walking to church, while Her Majesty rode in a car. I love this coat. 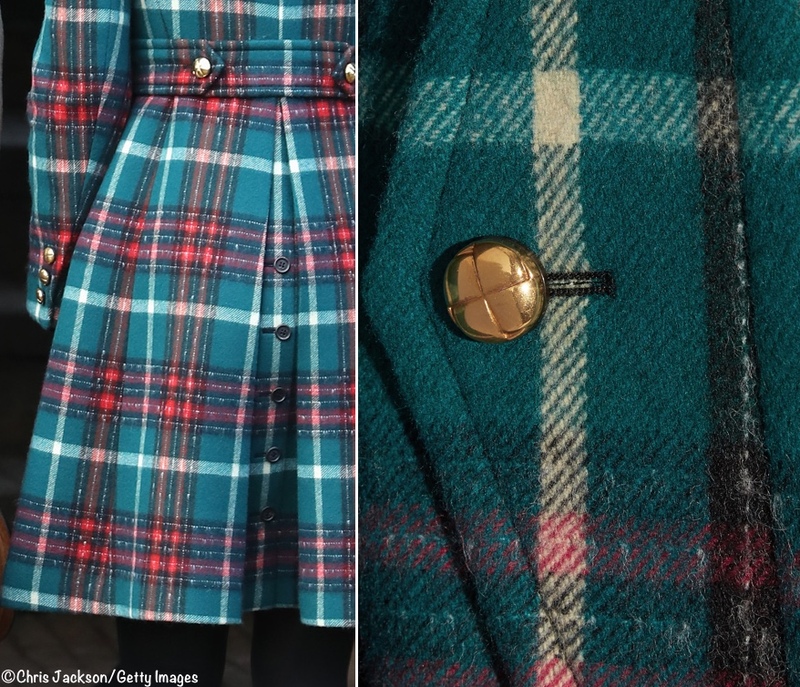 I love tartan coats and the colors/pattern on this one was absolutely perfect for today….very festive. Although I’m sure the hat was warm I’m not a fan of it. For me it just kind of takes away from the coat…it’s probably just me. Still Kate looked great as always. Oof, this was my least favorite year fashion wise and last year was my favorite. But I can’t blame Kate, it has to be hard being pregnant a third time! Wow I love this complete look ! The duchess looks fabulous and so happy. I wonder why the children weren’t at today’s services. Too young to sit through the service quietly, I would imagine. I expect George will start coming in two years or so, from when he’s six, and Charlotte likewise. May I chime in, I notice in the video that Autumn and Peter Phillips have their two daughters walking with them, just visible as the party moves up the steps. Savannah just turned 7, Isla is 5. Maybe George will attend next year. Well we’ll find out then. Thank you for another fine post, loved the discussion of the new tartan coat and how lovely Kate looked. Let me add to the chorus thanking you for a warm and wonderful site this year. It manages to be both informative and a positive, happy place. Kudos! I think Kate looks wonderfully festive here. Boots would be great with this coat if it didn’t have a contrast collar, and she didn’t also wear a wide hat with it, but I’m not sure that the horizontal line that boots would make shortly below the hemline wouldn’t, in this case, make for too many horizontal line breaks in the outfit as a whole, with the coat’s high-contrast pattern. I’m looking forward to the variety of styles we’ll be seeing from both sisters-in-law. And, I know this isn’t a Meghan blog, and it’s not a menswear blog either 8~) but when did men’s coats become as short as Prince Harry’s?? I’ve never seen anything like it, but I know nothing about men’s fashion. I will say Harry’s coat looks thin as well as short, and he looks cold! I think Kate looked beautiful today. My favorite Christmas look of hers is from 2015, which is actually one of my favorite looks of her ever. Does anyone know who made Meghan’s hat? I love this look!! I’m a sucker for a tartan coat dress and she looks gorgeous!!! I even like the hat as it’s so cold outside. I forget how tall Kate is until she’s standing by another lady…Miss Markle. Thank you, Susan, for a great year of posts!! Merry Christmas! Kate looks extra festive today in the plaid coat. I do like how its styled on the model a little better though. I wonder will we get to see this piece again, Kate is a fan of repeating outfits like the rest of us normally do, but will it be taken in/let out for her changing shape or hang in the ‘maternity section’ of her closet forever. Meghan looks polished and classy as always. And QEII is as bright as the clementine I had for breakfast this Christmas morning. Lol.. I love these holiday posts and pics of the family outings. Thank you Susan for a year of joy! I l o v e hats and the fact that DoC has similar hats in grey and brown is delightful. It was a lovely celebration of family. The Duchess looks fabulous! Perfect outfit for Christmas Day. I love the colors and the plaid. The hat is also lovely. My favorite photo of the day is the one of William and Kate, Harry and Meghan walking side by side. That is a keeper. I think William and Harry have made excellent choices in their spouses, and I wish them all every happiness. Merry Christmas! The post is, as always, lovely in detail and tone. Re: Kate’s coat – her styling brings again takes the wind out of an otherwise interesting item; and I wish she would buy maternity clothes. I should have deleted “brings”! I originally wrote “brings down” but thought it sounded more derogatory than I meant it. I understand she cannot, in her position, be uber trendy but this is a pretty great coat that is just ‘there’. I agree with you. Such a pretty coat but it somehow falls flat with the styling. Just dying to unbutton a button or two…. From personal experience and from observation, maternity clothes are dreadful! Kate is wise to avoid them IMO. I understand you very well, but there comes a point when regular clothes start to look worse than maternity. I have seen plenty of lovely maternity clothing in my time and Kate can certainly get hold of things that will make her look lots better than her non-maternity-let’s-hope-it’s-wide-enough clothing looks right now. Agree SaraF – I’ve been in the maternity boat as well and it’s hard, but not impossible (and certainly possible with Kate’s resources) to find good clothes. Even buying up a size or 2 and getting non-belly parts tailored would be better than buying something that fits everywhere but the belly. I agree! I don’t understand why people thinks she needs to wear them. The coat still fits so why should she not wear it? I hate maternity clothes….I avoided them until I had no choice. 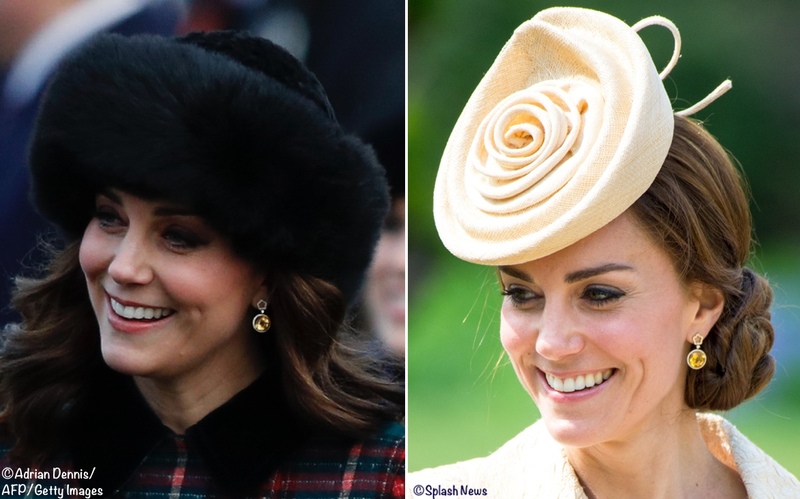 Someone may have already posted information about the hat worn by the Duchess today but it is very possible that it is a “Sumac” Lacorine hat which the Duchess had bought in black, chocolate brown and champagne, and apparently Pippa Middleton wore a brown one to the Cheltenham races quite a few years ago. There is more information about the hat (if in fact it is a Lecorine hat) on the Lacorine website. Will be very interested if in fact, it is the hat! As for the hat, again a classic! 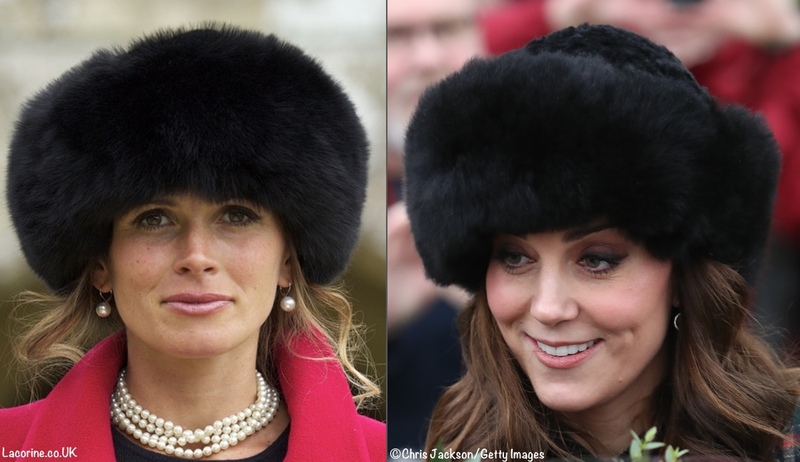 I do love a cossack hat in the winter and I think Kate looks great in them. I recall she wore this style, if not the same hat, to church in the past. . . Could it have been last Christmas? I think the coat would also look great styled in a more casual manner as seen in the ad photos but we are never going to see the DOC styled like that during an outing with the Queen! Finally, thank you admin for including the video of Kate greeting one of the onlookers. I love hearing her voice and seeing her move around in her clothes. I think she has a lovely voice and sounds very natural and sincere. Merry Christmas to all who celebrate! Kate looks lovely, though I wish she’d opted for boots or booties rather than the heels. I also don’t live the citrine earrings, though I suppose they coordinate with the gold buttons. Hat is fabulous, outfit is festive, and she looks glowing and happy. I dont love this coat in this formal iteration and prefer a casual styling of it but that said, Kate looks nice and very happy. It must be nice for Kate to have someone else to take the pressure of her and I can’t imagine either her or Meghan will take any notice of media comparisons, they are totally diffferent people and it will be fun to watch how they dress differently. I’m a big fan of Sophie too and whilst she looks great, she must be a bit chilly. Something tweedier for Winter in Norfolk perhaps. The Queen outsmarts them all. Fabulous. Thank you for your blog. I like the respectful and intelligent way you run it. Merry Christmas to all. I’ve been looking forward to the pictures from today’s church visit! I love Kate’s red, gold and green Christmas colours in her coat. I believe the reason Kate dresses so conservatively and even maturely is that she is going to be our Queen one day! She represents HM now, our country and the institution of monarchy. Every photo might be reprinted forty years hence, just like we see photos of the Queen from her twenties and thirties, so best play it safe and not undermine the monarchy! I think she has done an incredible job at this during all her time in public life. The best part of these photos is seeing her look so happy. I don’t think dressing fashionably or more youthfully undermines the monarchy. Crown Princesses Mary and Victoria usually are more age appropriate in their clothing, and Letitizia and Maxima are already queens and experiment with fashion. It is not like people are suggesting she dress like a Kardashian! Agree! All of the women listed above demonstrate that being queen does not prohibit one from being stylish! All Queens/Princesses are not equal. The Queen of England has far more public, political and financial influence in the world than those other ladies combined. Even if this were true, and I don’t believe it is, it certainly isn’t anything a polite person would say. It is my understanding that the royal family members are supposed to stay out of all political matters. Is this incorrect? I’d suggest censorship on this part of the thread. This isn’t a blog designed for comparing monarchies. Why do women pit woman against woman? I have loved this blog for honoring a young woman in a very public eye, not just her fashion – but also her activities which have major implications on her community. I like to think of the next generation she’s influencing while she honors the history. And dresses for herself and her own heart, spirit and style. Please don’t make this blog political or woman against woman. Yes, and yet the Queen in her young and middle aged years did dress more trendy, relative to the general public; and showing plenty of skin in her gowns. What I think is unfortunate for Catherine, is that she is measured against the styling of a very mature Queen, two generations before her. Were there a generation in between, say had Diana been present, I think that Catherine might not feel compelled to dress up to this more mature image presented by Elizabeth. Perhaps the style differential would not be so disparate. Rather she could evolve more naturally into her own style as some of the other European Queens and Royal Princesses have had the opportunity to do. I think maybe she has a simple style. She doesn’t necessarily dress this way for a reason just that she enjoys a simpler more minimalist style. I love Kate’s festive look today! Many times Kate surprises me with her accessories. Choosing those earrings — which I really like — to go with this coat is not something that would ever have occurred to me. But I can see that she was playing on the gold metallic buttons on the coat, and it worked for her. Altogether a great look for the occasion. I also love seeing her and William holding hands. They look very happy! Long time reader, first time poster. Just on the age thing, according to Wikipedia, there is only 5 months between meghan & kate (meghan being older). While I love how happy she appears, I agree with some others that I find this outfit frumpy and very ageing on Kate. I adore the detailing of this new coat. I’m always a fan of a back belt on a coat—as many people see the back of a coat as the front, so might as well make it interesting and flattering. And earrings to echo the buttons was brilliant. Happy Holidays! Kate looks glowing, lovely, and exudes a relaxed happiness in these pics. I particularly love those earrings. The BBC has footage of the curtsey. Kate is reported at 5’9″ and Meghan at 5’7″. Interesting. I just looked back at the photos and she does have a tiny, tiny frame. I know that it is reported that she is 5’7”, but if she is wearing the Stuart Weitzman Alljill boots, they have a 4 inch heal. Harry is 6’1”. I know that it is difficult to tell height from photographs, but there is just no way Meghan is 5’7”. Perhaps 5’4” at most. The proper way to curtsy is to place the right foot behind the left then bend briefly at the knees while keeping the upper body straight. The longer and deeper the dip, the more respectful the gesture. However, contrary to popular opinion, in this day and age, it’s not necessary for members of the public to curtsy to the Queen though if you do, it is still recognized as a sign of respect. Thank you so much for your blog. Always very respect. Well done! Amazing photo! 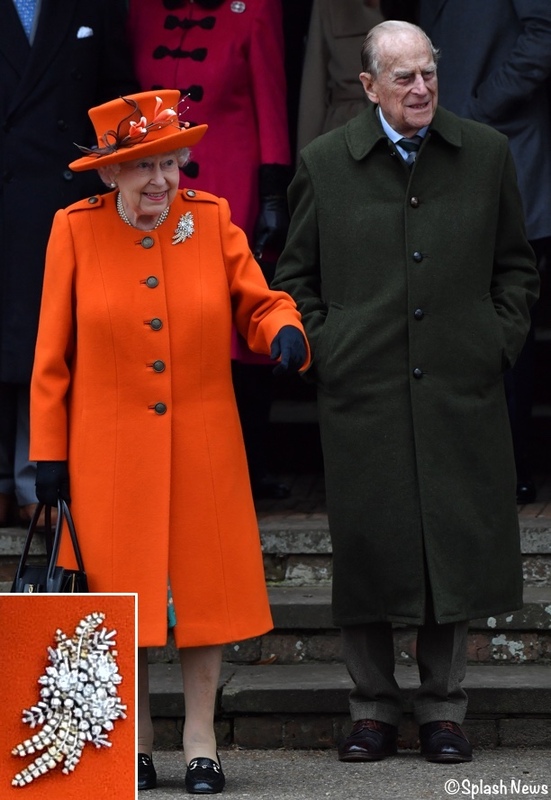 I love seeing the Queen in orange! I like the tartan coat on DOC although I think boots would of looked better with it. Love the hat! Merry Christmas to Susan and thank you for this fabulous, high-class blog! I agree—boots with that coat and hat would be spectacular (and much warmer). The ladies looked beautiful today. What a fun tradition they are continuing. 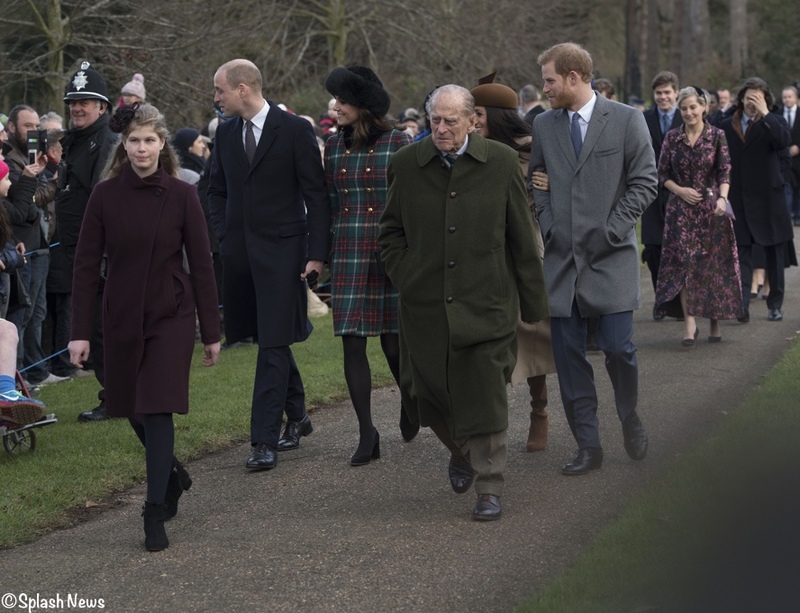 Kate’s plaid coat is unexpected but perfect for the season. I would have liked to see her pair it with on of her green hats but maybe for weather purposes it kept her warm. Her mother has worn something similar a few times. I would love to see the coat styled like the model with a turtleneck and black trousers with the top button open. Meghan is keeping it simple for her first Christmas outing. I look forward to her edgy style in the coming years. The Queen was on fire! Not sure I like orange for today but she can wear anything she wants. Just glad to see everyone happy and healthy. First off, Merry Christmas everyone! Secondly, I thought Kate looked gorgeous! I think the commenter who pointed out that the Tods pumps are maybe roomier and very comfortable hit the nail on the head. I’m sure her feet must get tired and swollen. Perhaps boots for the next outing of this coat but I have no problem with the pumps. I also ADORE that hat! Very fun! I think my favorite photo is the one of the four of them smiling at the camera. Kate looks so happy and I ma sure it is nice to have someone to share the spotlight with! Meghan looked nervous to me… but I imagine that’s to be expected!? I don’t love her long coat but that’s my style preference. It’s too similar to the navy one she wore before. But how fun to see the four of them together! I look forward to more outings with them all present. Love Kate’s look today! Very festive and classy. It complements her growing bump beautifully too. But most of all, I love her easy warmth and natural charm. Love the video of her chatting with the girl in a wheelchair. I can’t wait for the time that George and Charlotte will be old enough to attend Sandringham. I know they’re still a bit young. Renny, I’m thinking that George and Charlotte were at Sandringham but back in the building, with their nanny, while the parents attended church. I can’t see Will and Kate not being with their children on Christmas Day. Merry Christmas to all!! It was delightful to see all the Royals on their walk to and from church. The Queen and Camilla opted for really bright colors!! Everyone else were in more subdued outfits. And then there was the Countess of Wessex–definately different!! But back to Kate–I love this coat–just the right elements of a cheery and festive Christmas look. The black accessories are perfect. My only quibble is that the coat is not from a maternity line and I think there is a point when even if a regular piece of clothing is altered to accomodate pregnancy, the shaping is never quite right. It could be that Kate has, as people say ‘popped’ out more now and maybe when she got this coat she thought she would still not be showing as much. Who knows!! But the coat does have a beautiful look, details, and cut from the back. And Kate looks radiant and lovely as always. I do so agree about the media and their incessant attempts to compare and pit Kate’s and Meghan’s style etc. against each other–it’s so annoying and wrong. Unfortunately it will only get worse, I fear. It’s nice to see Prince Harry happy and having a partner of his own. Kate has been and is a good sister-in-law and I’m sure that will continue with Meghan too. I hope here on this everyone who frequents this blog is enjoying the day and the Christmas season!! Sophie’s outfit may be the first time I have ever liked Erdem! Beautiful coat, not a fan of this hat (though it does look warm and cozy). I would have paired this coat with boots. Lovely to see the Duchess happy and glowing in this winter weather. The earrings aren’t a new pair. 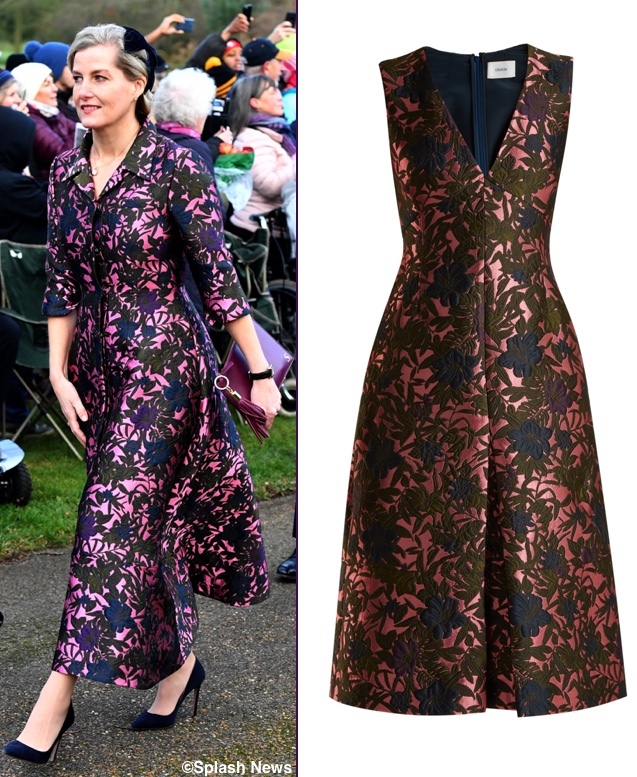 Catherine wore this pair in June, 2016 for the garden party in Northern Ireland. It’s always a pleasure to read your blog. Merry Christmas! Kate looks so lovely! I love it when she wears citrine earrings. What a fun, bold tartan! Not subdued at all, sort of a modern take on the tradition. Love the black lapels. And that hat looks so, so cozy and warm. It’s beautiful on her and one that I’d wear myself. She looks so happy. Just realized she’s been pregnant for three Christmases because her children are always born in spring/summer :). I noticed that, too. Her hat, boots, and handbag pick up his hair and beard color beautifully. Yes, Meghan and Kate have EXTREMELY different style aesthetics. Kate is very traditional, English preppy and Meghan is more 1970’s/90’s blend sleek New Yorker- I imagine a bit like her styling on Suits. On to Kate- as usual I love this hat, obviously not appropriate for every occasion, I think it can read as too casual because it’s so cozy looking, but it frames her face beautifully and is perfect for Christmas. The coat- lumpy- beautiful color and pattern perfect for Christmas and just ill fitting for a woman with a changing pregnancy figure. She certainly could have worn it earlier in her pregnancy, but not at roughly 5 months, it’s just not flattering. Another coat that will look lovely on her post pregnancy frame. Apologies. I am sending this from my sister’s phone! Thank you so much Susan! Lovely post. Kate looks lovely. The coat is beautiful, and while I think the hat is a bit severe, her smile makes up for it. I do agree that it isn’t distasteful to pit Kate and Meghan against one another. You are quite right that these women have very different styles. I don’t think it is fair to Kate to compare her style to that of someone a few years younger. Of course she is going to have more mature fashion choices. That being said, Meghan does look lovely! I am going to share who I think wins today’s fashion award – Louise! She looks so grown up and beautiful! Kate is younger than Meghan. Meghan is actually older than Kate. Meghan is 36, and I believe Kate is 34? So Meghan is actually the elder of the two. I have to admit, I didn’t believe any of you, so I just Googled it. Meghan is actually 5 months older! I’d love to know what skincare products she uses! Does anyone know where her fur hat is from? Dear Susan, I have just written some information about the hat, and my comment is awaiting moderation. Do let us know if it could be the Lacorine hat! Thank you for you lovely blog, and Happy Christmas! Any information about the hat? Oh dear. In order to make this coat look good, it needs to be styled the way it was done on the model. Otherwise, we have yet another example of a designer garment made to look frumpy by Kate’s choice of hat and other accessories. This look, while beautiful, is much better suited for someone much older than Kate. I have always been puzzled why Kate dresses so much older than she should; her wardrobe looks so similar to Camilla’s, for example. On so many occasions, I’ve wondered why Kate dresses older than Sophie does. Wow, Meghan looks incredible. I agree with you on the styling- it looks so chic they way the model has is styled with the pants, sweater, boots. It feels frumpy the way it’s worn here. Kate’s hair looks really pretty and she always looks so wonderful when she is pregnant. Love the coat. It’s very pretty and I like tartan. Kate is wearing a lot of color but not necessarily “Christmas” colors, which I find boring. She looks happy and healthy. That’s all I have to say. None of the videos would play for me but I think it’s the fault of my laptop and not the videos. I am not sure what you mean by this outfit not being Christmas colors; it’s red and green on my screen. I actually thought it was a little literal for a Christmas outing. And the gold buttons, as well as the double-breasted style, are not my favorite. Her hair is beautiful, and I like the hat for a cold-weather walk. Kate looks fantastic in this coat! Has she worn Miu Miu before? No she has not worn Miu Miu before except a clutch. Well, that’s quite an eyeful of colour from Kate here. It’s not my favourite outfit, I think the gold buttons on the coat are overkill on top of such a busy check and might have been better in black. And textured hat as well as velvet collar is further overload. Black accessories are the right colour choice and dark tights and chunky heels compliment the winter look nicely. I’m no fan of that hat style, but again it’s highly appropriate winter-wear, and I won’t deny that Kate looks unbelievably well in both coat and hat, the colours suit her and the soft hat material compliments her. I was interested to see that she and Meghan chose a similar hat shape and it was good to see Meghan flanked either side by both Harry plus William and Kate on her debut. The hang of the coat is not helped by the growing bump, of course, which also helps pull the hem up, maybe it would improve its look post-bump. It’s an exciting new label for Kate to dip into and I applaud her for experimenting. I was surprised at a new coat as I thought she’d leave the coast clear for Meghan’s debut. A very merry Christmas to you, Susan! Thank you for the lovely gift of this blog! Happy Christmas to all who celebrate! This was a mixed fashion outing for me. I like the design of the coat and plaid in general but I am not a huge fan of this color scheme…probably because it is a little on the nose with the Xmas colors. I don’t love the earrings. But I do love the fuzzy hat and I really love her hair like this…the waves I think are more modern than the big curls. I like Meghan’s outfit quite a bit and she is carrying a purse I covet. I actually also really liked Camilla’s look, too. Fun coat and hat. Lovely to see them all walking together. Happy Christmas! 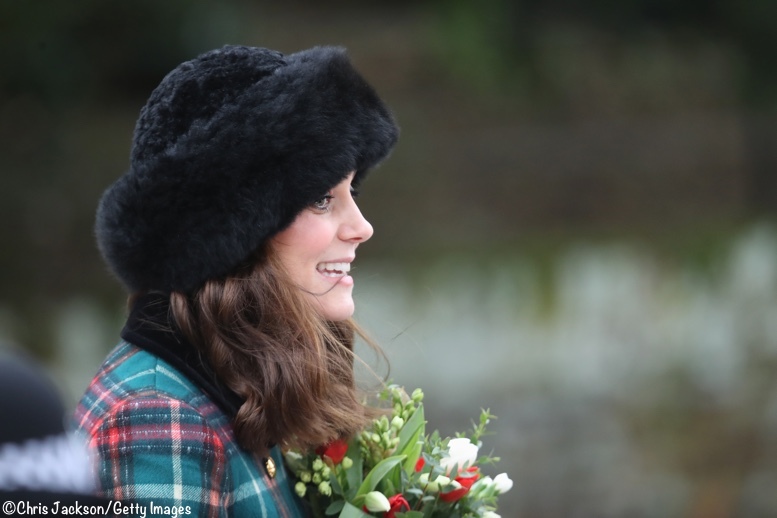 The Duchess looked marvelous today…Merry Christmas everyone!